Now that you have configured Autotask and the Secure Remote Access Appliance, deploy and configure the Autotask plugin. For additional information about working with the BeyondTrust Middleware Engine, please see the BeyondTrust Middleware Engine Configuration document. The Autotask Plugin shows in the list of plugins. Click the clipboard icon to add a new configuration. Autotask Services URL: The services URL for the Autotask instance (e.g., https://webservices<#>.autotask.net/atservices/1.5/atws.asmx, where <#> is the same number found in the URL used to access the Autotask web interface (e.g., https://ww<#>.autotask.net). Autotask Username: The username of the API account. Autotask Password: The password of the above user. Autotask Note Type: The type of note used for BeyondTrust Session information (default value is 1). Autotask Update Time Entry: Choose if you want the integration to create time entries based on the session duration and primary representative. Autotask Publish Notes as Public: If enabled, notes are published as public notes, meaning that they can be seen by end-users. Time Entry Default Data: Only used if Autotask Update Time Entry is enabled. This setting contains a JSON string used to represent default data passed for certain fields when creating the time entry. Most can be left 'null', but a few are required. Enable Automatic Ticket Creation on Session Start: When a session starts that is not already tied to an existing ticket, a ticket is automatically created. 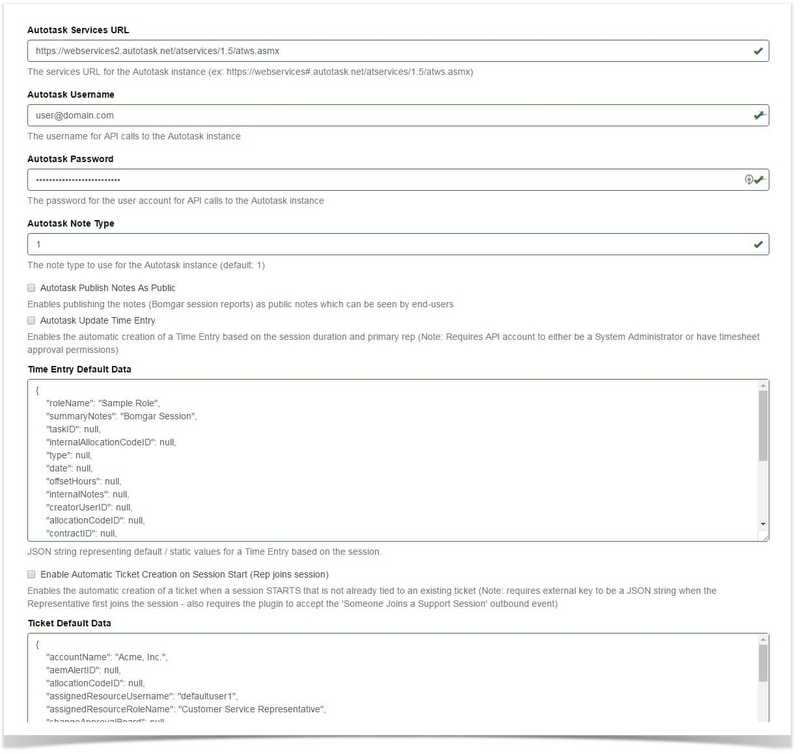 This setting requires an external key to be formatted in a JSON string when the representative first joins the session and also requires the plugin to accept the Someone Joins a Support Session outbound event. Ticket Default Data: This setting should be used only if automatic ticket creation is enabled. This setting contains a JSON string used to represent the default data passed for certain fields when creating a ticket. Any values provided in the external key override the corresponding default value provided here. defaultDomain: To identify a user in Autotask which matches the primary representative in the session, the BeyondTrust username is combined with this default domain to construct an email address. The email address should match a user in Autotask. roleName: This is a required field for time entry creation. The supplied role name must be a role in which any common BeyondTrust/Autotask users are members. summaryNotes: This is also a required field for time entry creation. The value supplied is used for all sessions.